Do you want to make the most of your life? Zig Ziglar, one of today’s most respected motivational speakers and authors, sincerely hopes and believes that you do. In this audio book, you will find a selection of Zig’s favorite Scriptures, an insightful message, thoughtful questions to lead you to a deeper application of the message, and an inspirational quote to motivate you each day of the year. 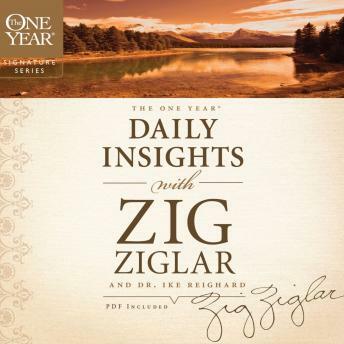 The One Year Daily Insights with Zig Ziglar will help you to discover and focus on your purpose, maximize your potential, and find and follow Jesus. The One Year: Do-able. Every One Year book is designed for people who live busy, active lives. Just pick one up and start on today’s date. Daily. Daily routine doesn’t have to be drudgery. One Year devotionals help you form positive habits that connect you to what’s most important. Devotions. Discover a natural rhythm for drawing near to God in an extremely personal way. One Year devotionals provide daily focus essential to your spiritual growth. It’s convenient and easy to grow with God the One Year way. Great book Zig is a classic. His diiscriptive insights are spot on. His lesions have truly taken my business to the next level.